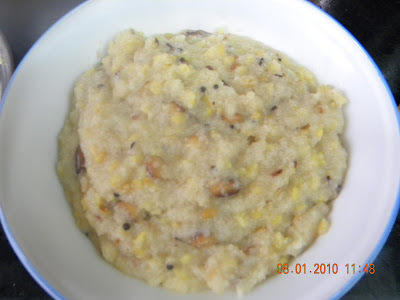 While casually surfing through net, I came across this wonderful recipe of rava pongal. This is a healthy South Indian breakfast which people from other parts can eat as a nice variation to regular fare. Rava pongal uses 2 main ingredients that is, rava or semolina and moong dal instead of dal and rice used in pongal. It's healthy and tasty and try it yourself before believing me. 1. Heat a kadhai/ wok and dry roast moong dal till aromatic and light pink. Take out from the wok and wash it thoroughly. 2. Place moong dal, 1 1/2 cups of water and salt in a pressure cooker and cook to 1 whistle. Open the cooker after 3-4 minutes. 3. Place the cooker on heat to evaporate the water in moong dal. 4. In the mean time, dry roast rava till aromatic and some golden grains appear. Take rava out of kadhai. 5. In the same kadhai, heat ghee or oil. Add mustard seeds and when they pop, add cashew nuts. Add ginger-garlic paste and green chillies. Brown them lightly. When the water in moong dal dries, take it off the heat. 6. Returning to kadhai, add 4 cups of water and bring it to boil. 7. Add rava slowly, stirring with other hand. Add moong dal and salt. Mix well. Cook stirring till pongal gets thick. Cook it to desired consistency. Turn off the heat. You can add lemon juice at this stage if you want it tangy. Serve rava pongal hot.